Hwy 101 mile marker 235c. Shore Acres is the third of five beaches, parks, and viewpoints on the "Charleston Loop". For details on reaching the Charleston Loop, please see either the Bastendorff Beach or the Sunset Bay entries on the prior page. 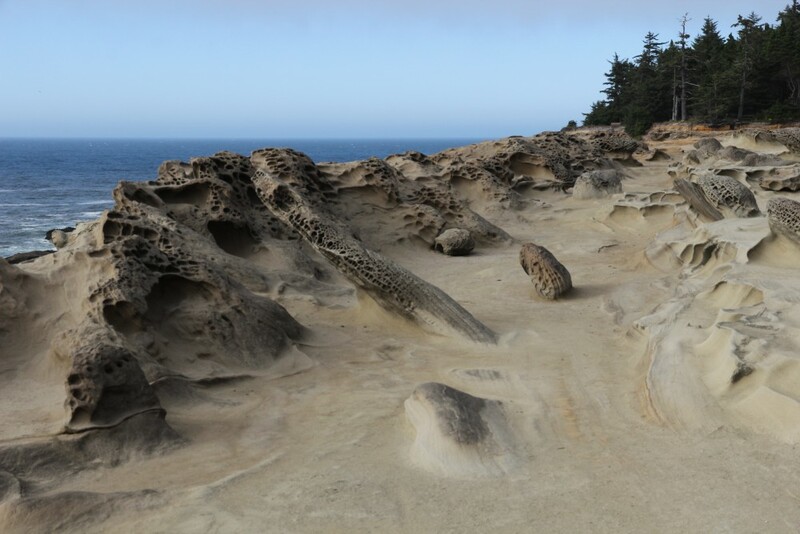 Shore Acres features very interesting rock formations, powerful wave action, the beautiful Simson estate garden (still maintained), and trails overlooking the ocean. More information is contained in the photo captions below. The site is the former estate of the lumber baron Louis Simpson, who donated it to the state prior to his death. In September, a classic car show is held in the field next to the main parking lot. 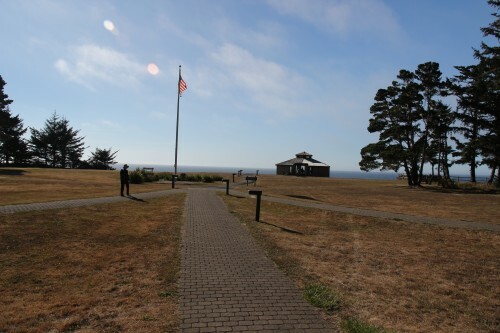 Site Resources: Interpretative info, 3 historic estate gardens (Rose, Formal, Japanese), gift center, observation deck near overlook edge, restrooms. 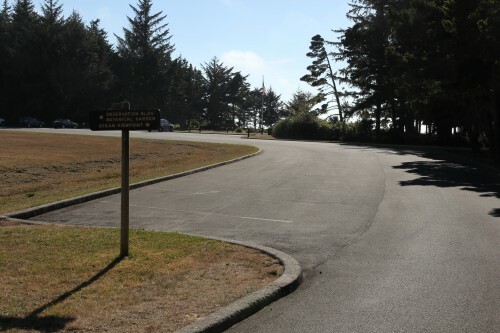 Oregon state parks link:Shore Acres State Park Parking fee required.. Some of the shorelines in the area feature massively tilted rocks and cliffs. 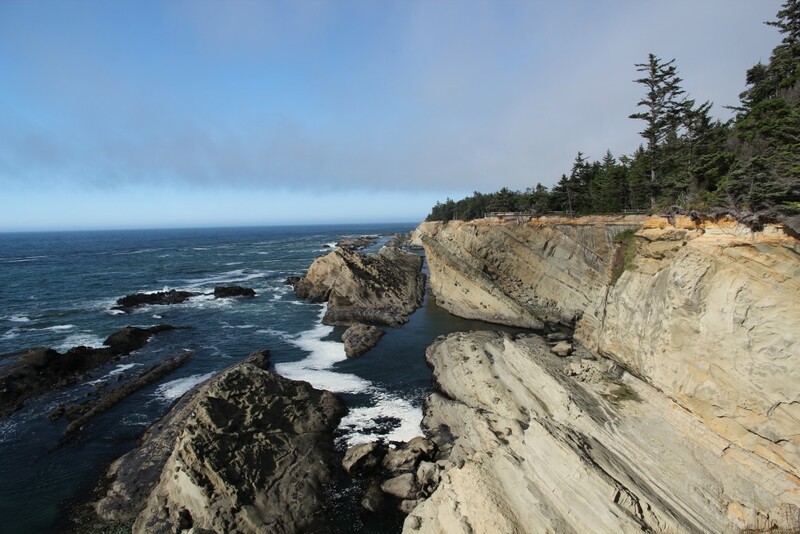 These layers of rock are part of the Coaledo Formation and are part of the Juan de Fuca tectonic plate, which is grinding upward over the North American plate. That's right: you're standing right on the exposed tip of one of the Pacific Rim's most locked and loaded pieces of Earth. Maybe you shouldn't stand too close to the edge. . .
A short trail from the observation building takes you to an otherworldly scene. The rock formations are quite unique here. The cannonball-like rocks are called "concretions", consisting of minerals that have hardened before the surrounding sediment. 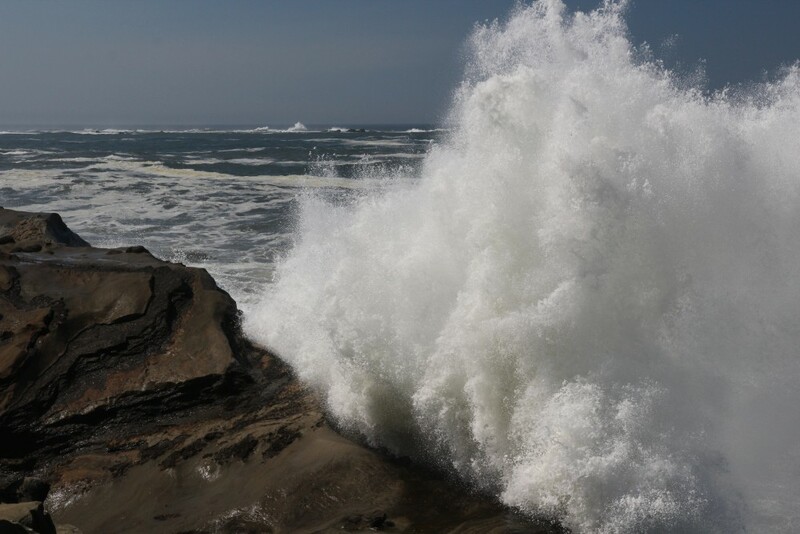 The 45-degree tilted rocks also provide an abrupt surface for the waves to smash against. When the Pacific is up, say 6-8 ft or more, you are treated to some impressive wave action. Apparently this wave action is impressive enough to warant the construction of the glass-enclosed observation deck - so you can watch the crashing surf during one of the winter storms.